KIDS FIRST! 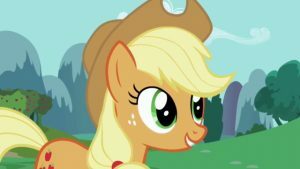 News » Blog Archive » My Little Pony: Friendship Is Magic: Applejack – Wonderfully animated, delightful stories, great lessons! 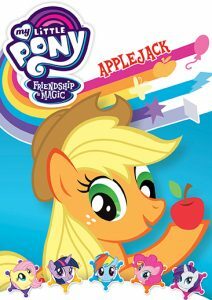 My Little Pony: Friendship Is Magic: Applejack – Wonderfully animated, delightful stories, great lessons! Think work on the farm is easy? 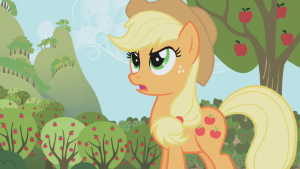 Then you don’t know jack – Applejack, that is! Honesty, patience and friendships are tested in a new collection of adventures featuring everypony’s favorite four-hooved apple lover! Join Applejack and her very best pals – Twilight Sparkle, Pinkie Pie, Rainbow Dash, Rarity, Fluttershy and Spike – as they experience the power and magic of true friendship. Bonus Feature: sing-along. KIDS FIRST! Film Critic Calista B. comments, “Even though these episodes are clearly for younger kids, I can’t deny that I actually really like these episodes. I don’t think I’ll actually start watching the show, but this show can be enjoyed by the whole family because it is very entertaining.” Adult juror Kimberly M. adds, “I love the humor in these stories, the visual appeal, interesting storylines and great morals that children can easily pick up. The animation is big and colorful.” See their full reviews below. Even though these episodes are clearly for younger kids, I can ’t deny that I actually really like these episodes. I don’t think I’ll actually start watching the show, but this show can be enjoyed by the whole family because it is very entertaining. This DVD is a collection of five shorts from My Little Pony: Friendship is Magic, with most of the episodes centered around the character, Applejack. She is an important character in every episode, even the ones that are not centered around her. I am aware that My Little Pony actually has some pretty interesting stories and can get pretty dark, but these episodes are filler. They do also reference major events in past episodes and one episode has two characters who appear to be recurring characters, so I really wouldn’t recommend this DVD as a way to fully understand what takes place on the show. 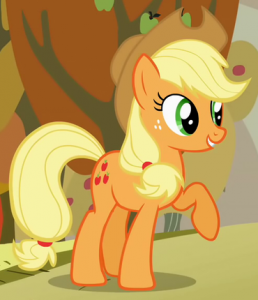 That being said, Applejack has a sweet southern accent, w orks on a farm and appears to epitomize honesty. I like that My Little Pony shows have a moral compass that teach positive lessons. This show should make lots of parents happy. 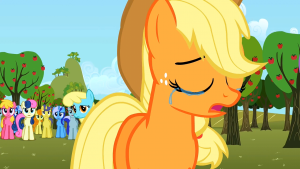 My Little Pony has a ton of effort and care put into each episode. I’m very impressed with this show. Often times in shows, filler episodes are boring and they make you wish you were watching a story driven episode. This isn’t the case with these stories! Now, My Little Pony has some really interesting characters. I love character driven stories and that best describes this series. The main cast consists of six characters, or “The Mane 6” as they’re often referred to outside the show. By the way, it’s an amazing pun. I really like when shows have a large cast of recurring characters that really make their world feel real. It helps world-building, character dynamics and of course, I love talking about characters in media. As I mentioned, these episodes focus mainly on one character, Applejack, but sometimes the other members of The Mane 6 share the spotlight. If you like Twilight Sparkle, Rainbow Dash and Rarity, then you will love this series because they are highly featured. My main issue is that, ironically, my favorite member of The Mane 6, Fluttershy isn’t in any of these episodes. I know the episodes are about Applejack, but from what I’ve seen of recent My Little Pony, Fluttershy is the most under-developed of the group. So please, My Little Pony creators, show some love and character development to Fluttershy. I give this DVD 3 out of 5 stars and recommend it for ages 4 to 12. The DVD is available now, so look for it. I found this DVD quite charming and filled with great lessons. Each episode in this collection is approximately 25 minutes in length. The storylines are very straightforward and the moral messages are charming and clear. They are very engaging for the target age. The characters draw you in with their multi-dimensional human personality traits. The language is quite suitable for the audience as well, although younger kids may not pick up every single word. The overall messages are what are important. 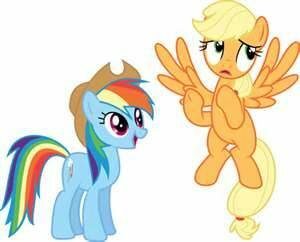 Applejack, the main character, maintains an integrity even if others do something different. If she does something wrong, then she accepts the mistake as well as its consequences and, more importantly, apologizes. The other characters hold the same level of integrity as well. Questioning and probing are developed when certain problematic situations take place. An example is when a pair of scam artists dupe a crowd at a circus presentation into believing that a miracle product cures ills, Applejack instantly feels there is something fishy going on and is concer ned when grandma pony purchases the elixir. 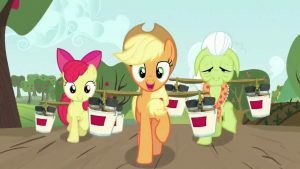 In another episode, Applejack’s younger sisters and friends want to help build carts for a race, but the older sisters take over designing the carts. The race ends in a big crash, destroying the carts. The younger siblings assert that the holder ones took over their project and the resolution is for the younger ponies to rebuild their carts without interference from the older siblings. I love the humor in these stories, the visual appeal, interesting storylines and great morals that children can easily pick up. The animation is big and colorful. There are five episodes and bonus singalong. The messages address how to be a person of high character, getting along with others, owning up to mistakes and apologizing. I give this 4 out of 5 stars and recommend it for ages 4 through 9. This entry was posted on Thursday, May 17th, 2018 at 10:31 am and is filed under DVDs Released. You can follow any responses to this entry through the RSS 2.0 feed. Both comments and pings are currently closed.